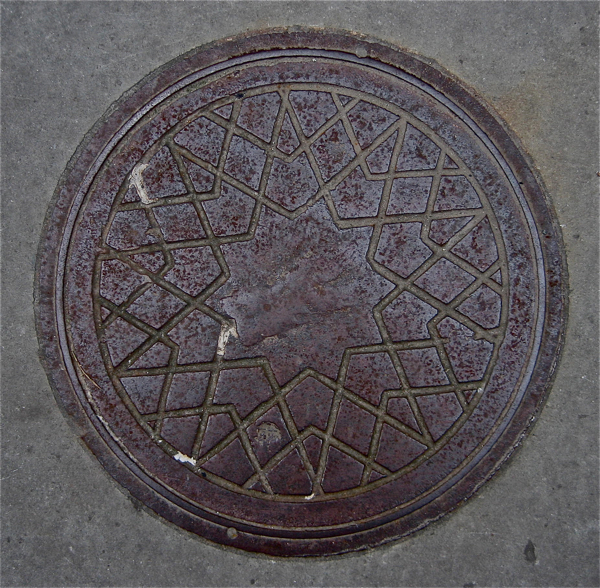 Ever since I wrote about sculptor Keith Bowler’s Roundels, describing how he set new manhole covers into the pavements of Spitalfields with motifs to commemorate all the people, cultures and trades that have passed through, I have been noticing the old ones that inspired him in the first place. This one from the eighteen eighties in Fournier St is undoubtably the most fancy specimen in the neighbourhood with its dynamic sunburst and catherine wheel spiral. 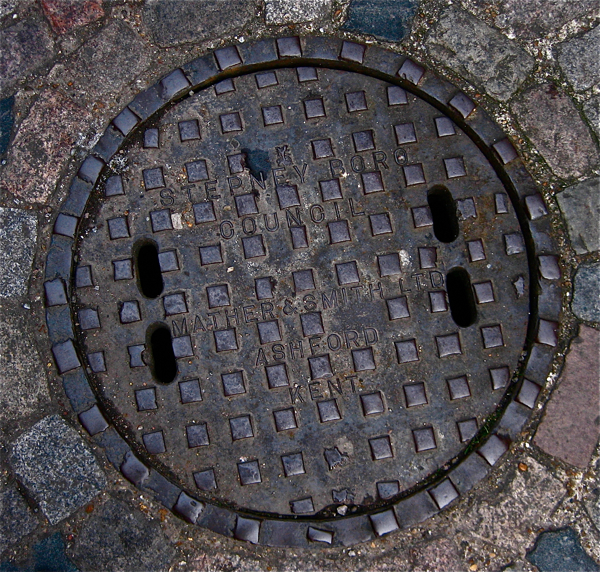 So much wit and grace applied to the design of a modest coalhole cover, it redefines the notion of utilitarian design. 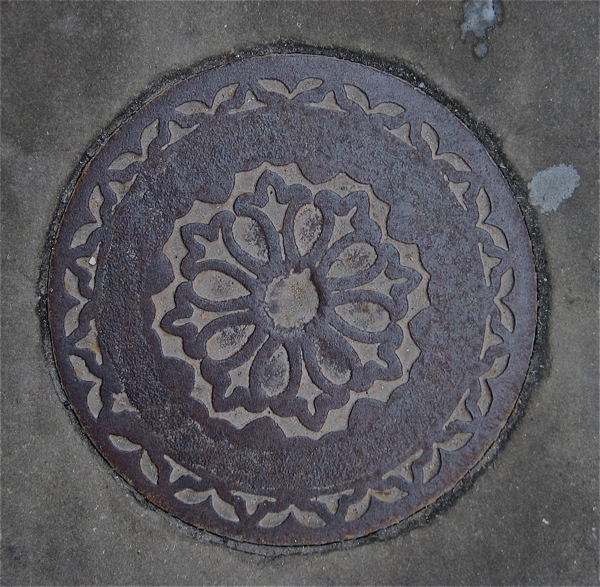 In Bath, Bristol, Brighton and Edinburgh, I have seen whole streets where each house has a different design of coalhole cover, like mismatched buttons on a long overcoat, but in Spitalfields they are sparser and you have to look further to find them. There is a second example of this Clark, Hunt & Co sunburst, that I like so much, in Redchurch St, just a hundred yards from the former showrooms at 159/60 Shoreditch High St of this company who called themselves the Middlesex Iron Works – founded in 1838, proud contractors to the H.M. War Office, the Admiralty and London County Council. And like many local ironworks, gone long ago, but outlived by their sturdy cast iron products. 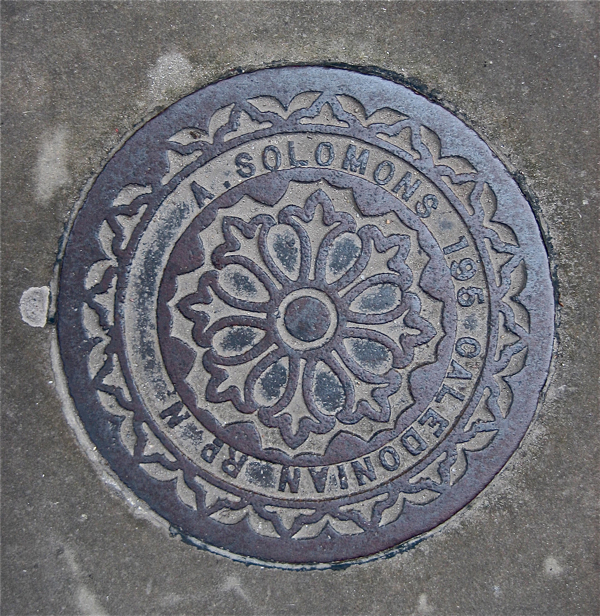 Alfred Solomons of 195 Caledonian Rd is another name I found here in Spitalfields on a couple of manhole covers, with some rather fetching, almost orientalist, nineteenth century flourishes. I discovered that the Jewish Chronicle reported the birth of a son to Alfred’s wife Celia on 18th December 1894 at the Caledonian Rd address, so these plates commemorate them personally now. 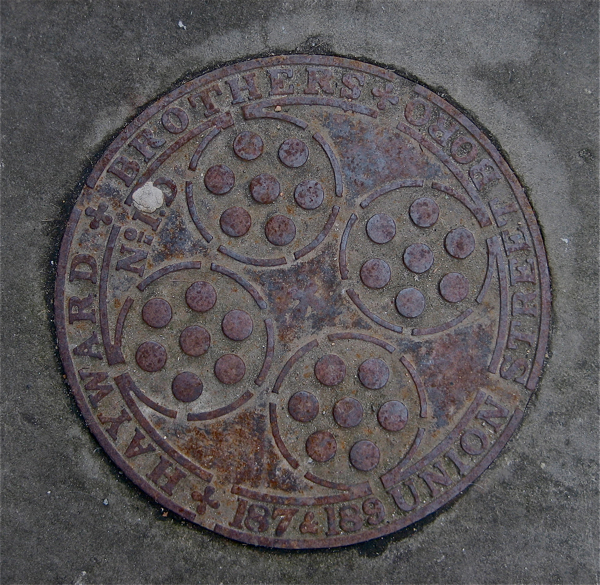 Meanwhile Hayward Brothers of 187 & 189 Union St, Borough, are the most ubiquitous of the named manufacturers with their handsome iron artefacts in the pavements of our neighbourhood. They were founded by William & Edward Hayward, glaziers who had been trading since 1783 when they bought Robert Henley’s ironmongery business in 1838. As glaziers they brought a whole new progressive mentality to the humble production of coalhole covers, patenting the addition of prisms that admitted light to the cellar below. You can see one of their “semi-prismatic pavement lights” illustrated below, in Calvert Avenue. Such was the success of this company that by 1921 they opened a factory in Enfield, and even invented the “crete-o-lux” concrete system which was used to repave Regent St, but they ceased trading in the nineteen seventies when smokeless zones were introduced in London and coal fires ceased. Regrettably, Spitalfields cannot boast a coalhole by the most celebrated nineteenth century manufacturer, by virtue of their name, A.Smellie of Westminster. The nearest example is in Elizabeth St, Victoria, where I shall have to make a pilgrimage to see it. Unfailingly, my fascination with the city is deepened by the discovery of new details like these, harbouring human stories waiting to be uncovered by the curious. Even neglected and trodden beneath a million feet, by virtue of being in the street, these ingenious covers remind us of their long dead makers’ names more effectively than any tombstone in a churchyard. There was rain blowing in the wind yesterday but when the sun came out afterwards, the beautiful old iron covers shone brightly like medals – for those who had the eyes to see them – emblazoned upon the streets of Spitalfields. 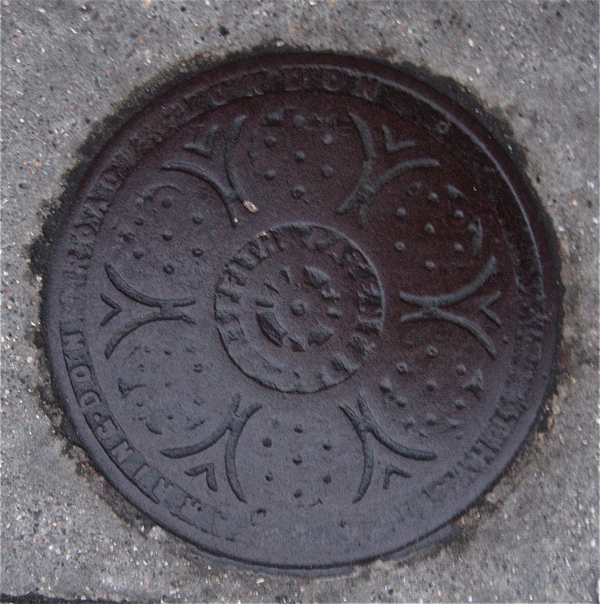 In Fournier St, a nineteenth century coalhole cover by Alfred Solomons, 195 Caledonian Rd – I am reliable informed there are similar covers in Doughty St and around Bloomsbury. A more minimal variant on the same design by Alfred Solomons. Hayward Brothers’ “Patent Self-Locking Semi-Prismatic Pavement Light” in Calvert Avenue. 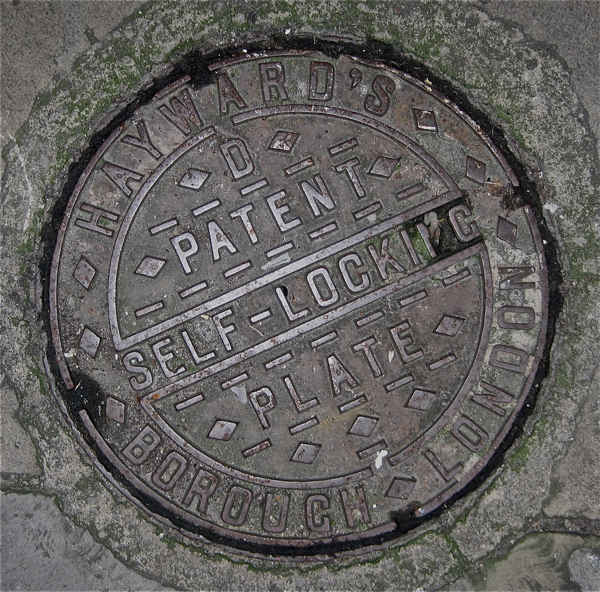 A more recent example of Hayward Brothers’ self -locking plate. 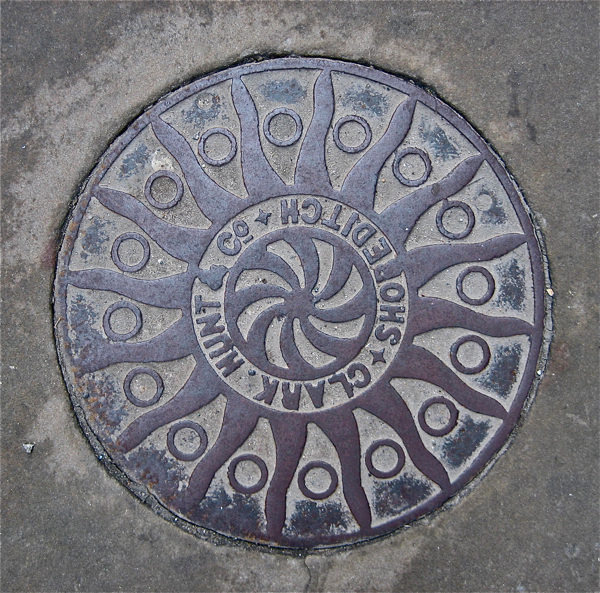 In Gunthorpe St, this drain cover commemorates Stepney Borough Council created in 1900 and abolished in 1965. At the Rectory in Fournier St, this early plate by Hayward Brothers of 187 & 189 Union St, Borough, which is also to be found in Lower Richmond Rd. 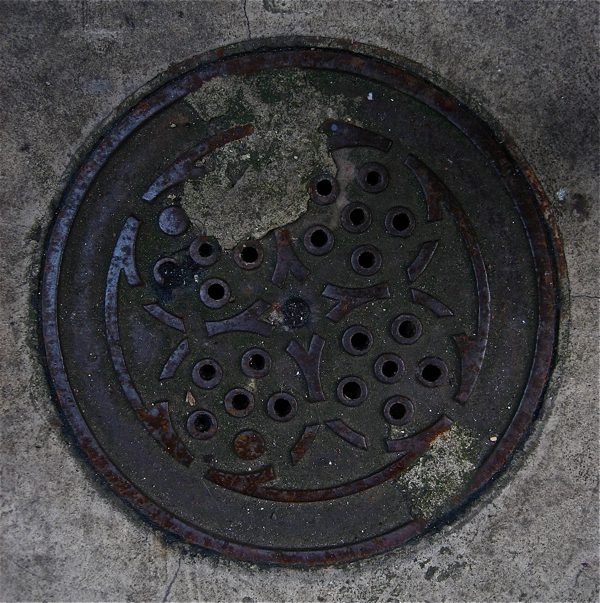 Another by Haywood Brothers in Spitalfields – although unlabelled, it follows the design of the plate above. In Middlesex St. LCC – London County Council was abolished in 1965. 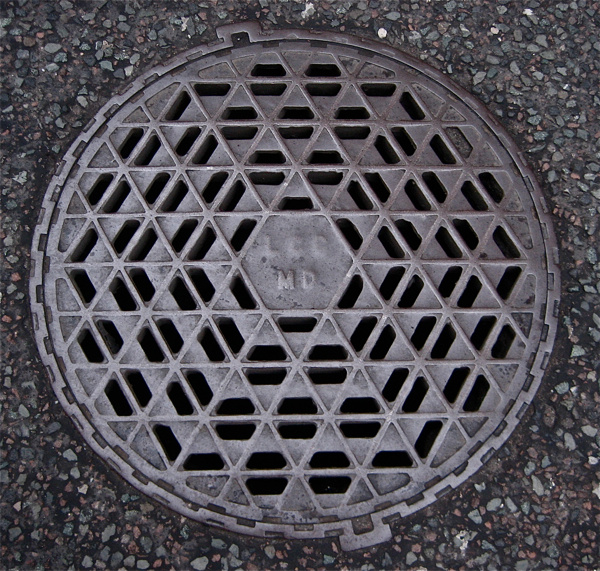 Can it be only co-incidental that this old manhole cover in Petticoat Lane Market, in the former Jewish quarter, has a star of David at the centre? Fascinating! My eyes never noticed what my feet were wearing down. 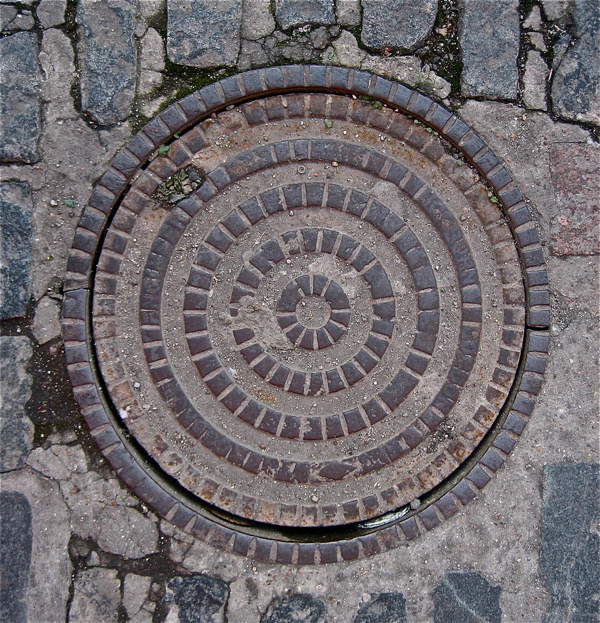 I’ve always thought that there is a great deal to be learned from drain and sewer covers and also drain pipes. Sadly the later seem to have been replaced by plastic ones especially here in Israel. Does anyone remember the metal plaques around Wilton Way in Hackney ” Dr S Charity 1870″. On my last visit about one year ago I spotted a few left, but they are high up on buildings. In the late 1980s, these manhole covers obviously became sought after objects because I had two stolen in rapid succession from outside my flat in Chisenhale Road! The covers concealed access to the coal hole under the pavement, by the door to the basement, presumably allowing the coalman to deliver in the absence of the occupants. Eventually, Tower Hamlets Council agreed to concrete a new/old cover in and the problem stopped – at any rate, it was still there when I moved on in 1992! Surely these are coal-hole covers, for tipping coal into cellars, rather than manhole covers, where people went down into the sewers? These are great pieces of social history but like everything that doesn’t gain much attention they are very vulnerable. In Greater Manchester there was a spate of thefts as the price of scrap metal soared a few years ago leaving gaping holes in pavements. Replacements are inevitably bland and, for the smaller ones, made of plastic. Perhaps some of the best need protection like the Bocca della Verità in Rome – a huge manhole cover carved from marble that dates from Roman times. More like coal-hole covers methinks. It would be a thin man indeed who could get through one of those. Another project I never found the time for, and now you’ve done it for me! Great stuff. The coal cellars themselves under the pavement can be pretty cavernous. You couldn’t do one on Bristol iron pavement edging and save me the trouble…….?! There should be some sort of preservation society for these, similar to the one that restores milestones. 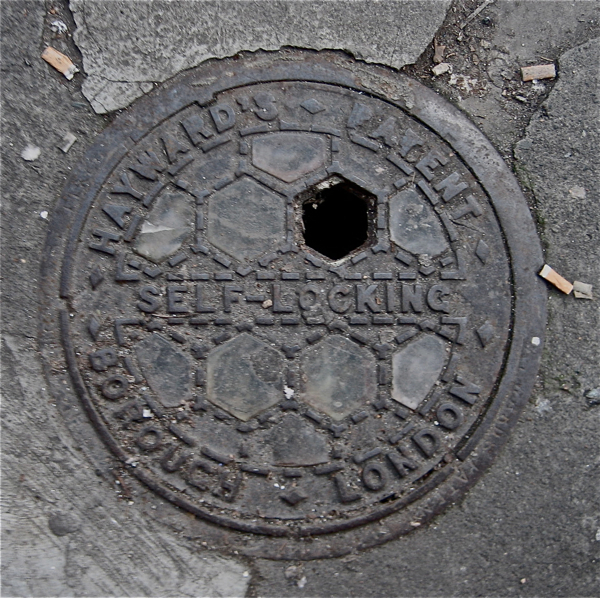 There are also a lot of old manhole covers in Cephas Avenue Stepney! Good thing you have pictures of these lovely covers before they are pinched as well! I have an image of a lovely one in Brick Lane with 4 pairs of scissors and a variety of buttons. Every time I visit London, I’m fascinated by the beauty and variety of these covers, so different from the plain utilitarian ones in the Netherlands. I especially remember one with keys and doorbells, I believe it is on Commercial Street. We used to play marbles on those coal hole covers !